The advisor of Portsmouth West High School's 2018-2019 Mock Trial team is Ms. Johnson. Competition season will be starting in January 2019, but the practices will begin September 26, 2018. Any students interested in participating in Mock Trial please see Ms. Johnson as soon as possible. To know more about Mock Trial click here. 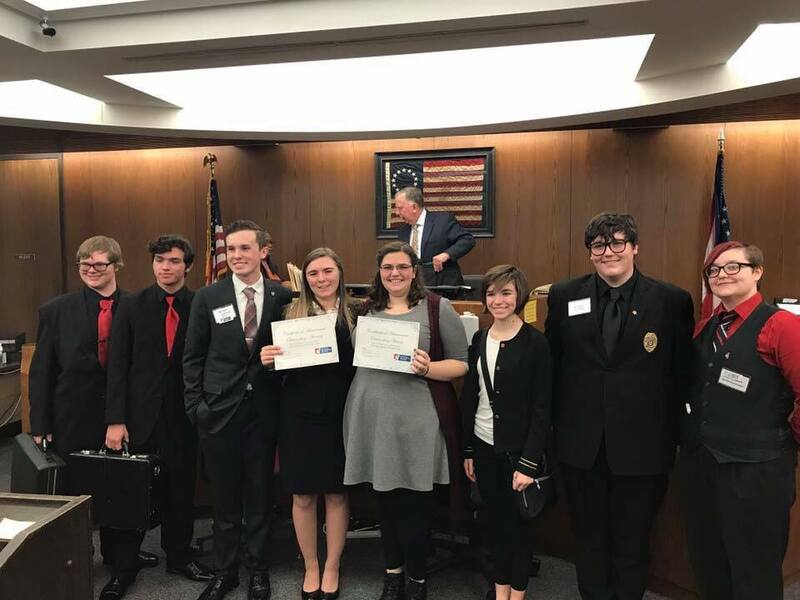 Portsmouth West High School Mock Trial Team competed Thursday, March 8, at the state competition held at the Franklin County Courthouse. The team performed well but fell short in its efforts to make it to the national competition. The prosecution side won its match against Logan. The defense tied West Jefferson and, then, lost by one point. West placed in the top 18 teams in the state this year and had five trial wins overall and 10 outstanding awards. Sophomore Whitney Campbell received Best Attorney award at state, and senior Jordan Willis won Best Witness. To view more on Ohio High School Mock Trial, click here. Contact Ms. Moorhead, PWHS advisor, if you'd like to participate next year.